Calista Leah Liew: Carlsberg DJs Spin Party ft. Keli Hart! Now I know what you're thinking. Two things dont go here. 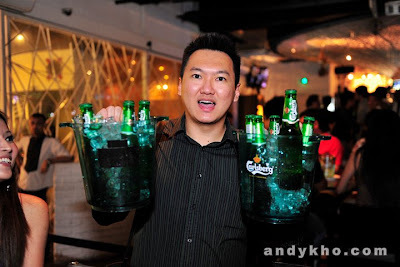 One, Calista doesnt even drink, so, Carlsberg? Secondly, DJs? Yo, I thought you didn't like house music or whatever these DJs spin? Plus hey, my friends are Carlberg fans so, who am I to stand in the way of their fun right? (Selfless, I know ;p) Uh-huh. And that was just the beginning! And Keli Hart has to be the exception to the DJ rule, cz she spins songs I listen to, and does a damn good mix of them! As soon as she got up on that console, we were dancing and having the most fun I've had in ages! Which reminds me.. I havent mentioned who I went with have I? =) These crazies, that's who! Arrived at Ecoba Restaurant and Bar, which is at the PJ Trade Centre with Sue, and proceeded to order mushroom soup and a latte, while I ordered potato wedges (surprise, surprise) cz we were starved.. This was my 2nd time at ecoba (The 1st when I did the Alfaparf shampoo launch), and I must say, I'm very impressed with the ambience of the whole place. The soup is REALLY good! From the taste of it, I'd guess it's made with wild mushrooms. Definitely a must-try! Around 12am, it was time for Aussie DJ Keli Hart! Keli plays House/Electro/Prog/Tech/Breaks (and yes, feel free to drop a comment to explain what the genres are, especially Tech and Breaks, lol.. All I know is I can dance to it! ;p), and is not only one of the hottest DJs in Australia, but also a producer with her own label Dolls House! You can check her out HERE. So yes, she DID get the party started! You could literally see the club start moving (the seemingly unlimited supply of Carlsberg might've helped that along too ;p) and when two exceedingly tipsy guys are with two naturally crazy sober girls, this is what happens: These two were cracking themselves up!